How does your email marketing performance compare to your industry peers? This is the question most of us marketers aren’t asking, but need to be. How do your open rates compare to the rest of the industry? Are they improving? How about your click-through-rates? Ultimately, these are the email metrics which enable your email marketing to drive your bottom line and generate business growth. Improving your email performance is a never-ending challenge due to changes in the marketing ecosystem, shifts in end-user attention, and changes in how consumers view content across various devices. Through proper testing and benchmark methods, you can improve your email metrics and accelerate the success you see from your programs and overall ROI. Testing provides you with insight into the area(s) your email marketing efforts are performing and the areas that require improvement. Commonly, most email testing is referred to “split testing” or A/B multivariate testing. 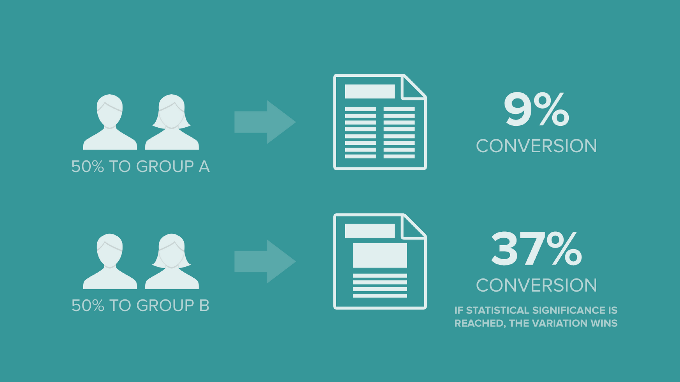 Essentially, a/b testing revolves around setting up two subject lines, two pieces of copy, two email headers, and so forth to determine which performs the best in terms of engagement among a small sample size. Varying from simple to complex testing: simple a/b tests allow you to determine the copy and creative that drive the highest open rates, click through rates, and engagement among end-users. Complex A/B tests can involve testing the customization of pictures, specific design assets, and calls-to-action. The first thing you should test, if anything, is your subject line. Click-throughs and engagement won’t matter if your audience doesn’t open your email in the first place! Hint: If you’re interested in testing out your Subject Lines before ever hitting send, give us a shout. Our Subject Line Analyzer does just the trick. Your subject line is the first thing an end-user sees when your email hits the inbox: the second thing they see are the pictures, banners, and visuals associated with your email upon opening. In an age of continuous partial attention, attention spans are waning: the average attention span is eight seconds, down from an average of twelve seconds, according to studies. This means as marketers, we have less time to capture consumer attention through headlines, subject lines, and email design elements. Paired with the right copy, visuals are essential towards driving email engagement. Use split testing here as an opportunity to expand your range of visuals: is your audience engaging more with infographics or with shots of the actual product or service being performed? Do they prefer serif vs. sans serif fonts? Perhaps it’s time to experiment with GIFs or short videos, if appropriate. Split testing allows you to determine what types of content your ideal customer will be responding to. Speaking of video, if you’ve had any experiences with Facebook Video Ads, you know that video content seriously converts when done right. If you’re looking for more proof that video delivers then might we suggest looking at one of our partners, Vidyard. Aside from the video content itself, you can split test elements like size, placement, and orientation of your videos to determine where the engagement stems from. Last but not least, test every element of your call-to-action (CTA): the wording of your CTA being the most important to drive action, whether that be site traffic, sales, etc. Be detail-oriented when it comes to split testing your CTA: does a CTA with the word “free” or “save” perform better? How about a box outline or a rounded-corner outline? Which fonts or colours do your end-users react best to? There is no such thing as too specific when it comes to testing your CTA, since it’s the gateway to the customer action that drives conversions and true email marketing ROI. Bonus: The tense of the language you use is as important as the value of your CTA (which we cover in our previous blog post on perfecting your call to action). When in doubt, use simple and direct language to convey the value of your call-to-action. Writing in the active tense, instead of passively, has been shown to increase engagement due to improved message clarity. Remember: split/testing is an iterative process that will constantly evolve the success of your email marketing program, if you let it. There’s no such thing as too much testing, either: Google is estimated to test their landing pages over 7’000 times monthly. And that’s Google. For more information on other tips to split-test your emails or ways you can improve your email marketing programs, contact us here.